But from her early radio roles in the 1950s, through to her scatty antics on Absolutely Fabulous, she made more than 1,300 appearances on radio and TV. 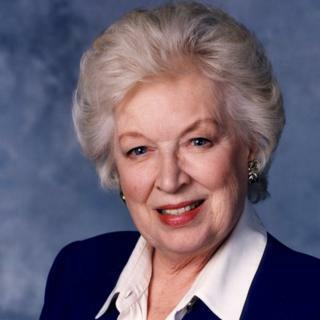 June Rosemary Whitfield was born in Streatham, south London on 11 November 1925. Her father was a telephone company executive, her mother an amateur actress who pushed her young daughter into dramatics and dancing. Trained at Rada, to which she attributed her hard work ethic, Whitfield took her first professional acting job in 1944. She was soon in demand on stage, radio and later television, and her long and varied career made for some surprising connections. When she appeared in the London production Ace of Clubs, she was befriended by the show’s creator, Noel Coward, and spent weekends at his glamorous country home. Later she joined the chorus line of South Pacific, with its American lead Mary Martin, dating the star’s young son, a pre-Dallas Larry Hagman. However, her husband of 46 years, Tim Aitchison, was not from the same industry, but a chartered surveyor. Whitfield’s ability to conjure up characters and superb sense of comic timing kept her in demand from across the entire canon of British comedy. Stars such as Tony Hancock, Frankie Howerd, Ronnie Barker, Benny Hill, Bob Monkhouse and Tommy Cooper all clamoured to work with her. 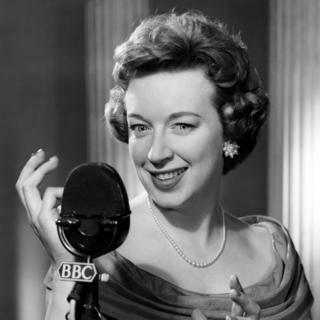 She called her autobiography …and June Whitfield, in recognition of the fact that she always got second billing. 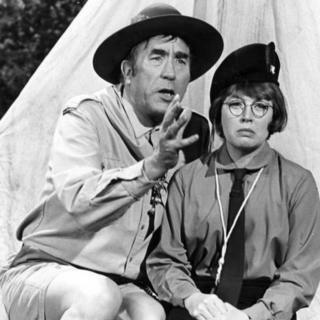 With Frankie Howerd, she recorded a version of the song Je T’aime, but even their spoof, complete with ironic heavy breathing, was considered too risque for the time and was famously banned by the BBC. Her most memorable radio role was in The Glums, Frank Muir and Denis Norden’s spoof family soap, part of the popular show Take It From Here. For seven years as the long-suffering Eth, her most oft-heard line was the lamenting “Ooh, Ron”, addressed to her hapless fiance. And for two decades, she read the News Huddlines for her long-time friend and colleague Roy Hudd, in radio’s longest-running audience comedy. Her first starring TV role came in the BBC sitcom Beggar My Neighbour in 1966. She went on to form her first working relationship with Terry Scott in Scott On….. before the pair teamed up again for Terry and June. The chemistry between the unflappable Whitfield and her hare-brained husband was so solid that many viewers believed they were married in real life. 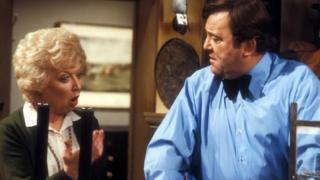 Described as the apotheosis of undemanding, middle-class, primetime comedy, Terry and June attracted audiences of 15 million during its eight-year run. Whitfield described herself as living “in the suburban corner, in real life and in the parts I’ve played. Very English, and nothing wrong with that”. In 1992, she became an unlikely icon to a new generation of fans with her portrayal of Edina’s unworldly mother in the internationally successful Absolutely Fabulous. Originally scheduled to appear in just one episode, she went on to become one of the show’s most popular characters. 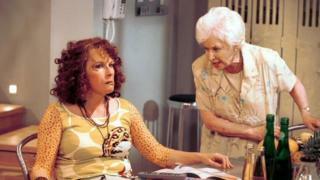 “As Joanna Lumley says, Ab Fab made us born-again actresses,” she commented. As the new century dawned, Whitfield continued a wide variety of roles including parts in Midsomer Murders and that retirement home for actors of a certain generation, Last of the Summer Wine. In 2009 she appeared in The End of Time, the Doctor Who episode that was the last for David Tennant. She was awarded an OBE in 1985 and CBE in 1998 and, in 2017, became a Dame. Despite her success, Whitfield never wanted a lead role, explaining that she lacked the drive and confidence. And as the on-stage muse to stars like Hancock and Cooper, she was all too aware of the personal cost. When they died prematurely, she attributed this to “the responsibility, the stress and strain” of carrying the show. 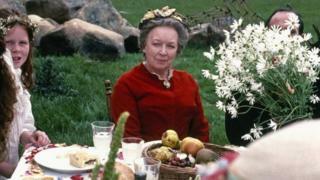 Instead, June Whitfield revelled in her role of versatile sidekick for three generations of audiences. She enjoyed enduring popularity and success, a life she described in her autobiography as “full of love, affection and laughter, of gigs, gags and a couple of gongs”.